I’ll bet you didn’t know that was Walt’s middle name? Well, it was. I don’t know if he cared whether anyone knew or not but, unfortunately, he is no longer here to berate me for telling everyone, and that hurts. Badly. Walt died yesterday (February 6, 2013). 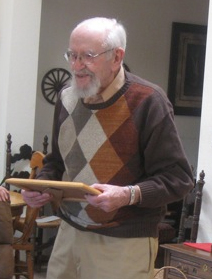 Walt Murfin is shown here being awarded a CESE plaque honoring his many achievements (February 4th, 2012). He had a very hard time of it for almost a year, first with a hemorrhagic stroke, and then finally with pneumonia. It was all too much for him. Even someone with such a strong will and intellect as his finally had to let go. His wife, Bettyann, stayed with him at his home until the end with her daughter next door, Walt’s son, John, and Hospice to help out. Still, it is pretty tough. Walt was nearing 89, and a year ago, still sharp as a tack and a bit of a rascal on occasion to boot! But Bettyann shared him with us, CESE. So he was our rascal! He was one of the smartest people I have ever had the privilege of being around. He was also a good friend – a very good friend. Though meeting late in life, we saw things so much alike that it was as if he and I had known each other for many years. Sure, we didn’t agree on everything, but on most things. When he would get upset with me, he would eventually apologize. When I would get upset with him, he eventually would apologize. Yes – you heard that right. Walt was a complex person. Walt and CESE went together as if they were born for each other. I personally think that CESE gave him some added purpose as he got older and, in fact, he was a great asset to CESE. 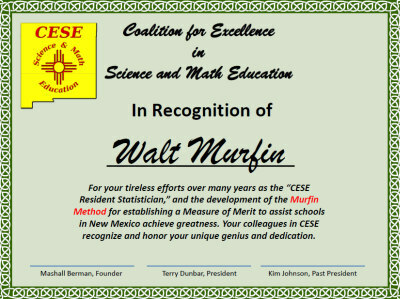 Walt, along with Marshall Berman, was the impetus behind the Murfin Method, or as he wished to call it, the CESE Method. This is a unique way of determining how to improve the educational system (K –12) in New Mexico. Walt worked on this for days at a time, developing the method and details of computations. Walt also help Marshall evaluate data when Marshall was on the state school Board of Education before it was done away with. 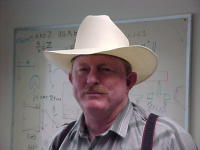 He helped former CESE president, Steve Getty, perform needed analyses in his educational work. In other words, Walt became very wrapped up in education and in the CESE cause of improving not just science and math education in our state, but also improving all education. He worked on this constantly and passed the results and methods on to anyone who would listen. It has always been CESE’s hope that the state would seriously listen to what we have to say and act upon it. Walt worked very, very hard to that end. Even after his stroke, he recovered enough to almost desperately make sure that his work could be replicated. And people have been listening! And, Walt, we are trying to carry on, but you will be impossible to replace. The best we can do is to hope to come close. Walt, you have done more than your part to make the world a better place. That’s all one could ask of another person. We miss you very much, Walt. Happy sailing.